I’m taking my tortillas to a chilaquiles party. Gathering up my totopos for the chilaquiles party. Coming down from the rooftop with dried tortillas in my apron. I’m a modern day Juan Diego with a short little ayate. the clothesline up on the azotea, the storage room (those have gotten a little moldy). It’s not hard to remember. I always forget the ones in the bathroom, and somehow a few always end up underneath the twin bed in the living room, the one we use as a couch. I’m taking my tortillas to the chilaquiles party. All year long, I’ve been waiting for the chilaquiles party. Some of my tortillas are tough and leathery. Others have turned into a pale green mush. Some have striking patterns formed by beautiful red fungus. Most are hard like rocks. No tortilla’s unfit for the chilaquiles party. Once I’ve found them all. I throw them into a sack (a pillowcase will do) and take them to the chilaquiles party. I’m going to a chilaquiles party. Once-a-year, highly anticipated, chilaquiles party. And gossip with the women in the kitchen. gently beating their fingers together in repressed exhilaration. Or maybe the face of Barack Obama, Hugo Chávez or even Padre Solalinde? Dolores goes along with it and “finds” the face of Jesus. It’s the same performance every year. They’re all kind enough to laugh just the same. 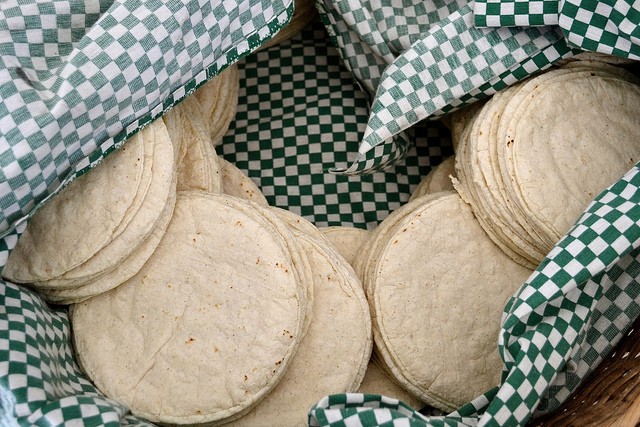 We used to stomp on the (mostly) dry tortillas on the kitchen floor and imagine ourselves as French peasants in modern day Mexico City. That was until the year Martha sliced her foot open and got a nasty infection. Now everyone takes a small hammer and a pair of scissors and sits on the floor among a field of totopos, each inside our own personal little crop circles, smashing and snipping up the dried sheets of nixtamalized corn. What scissors can’t handle, we toss over to Juan, who’s standing at the ready with a miniature guillotine mounted on top of a bedside table. Helen takes one of those floor squeegees and pushes all the tortilla muck and mildew into a corner. We’ll add that to the salsa. Every year is more surprising than the last. I slip past Juan and gayly toss my fresh-cut totopos into the vat of bubbling oil Grandma Ermenegilda has been working all night and all morning to get to the perfect temperature. We’re cooking up totopos at the chilaquiles party. This year’s sauce is green. I haven’t seen red sauce since I was first invited, back in ‘08. Julio brings his award-winning tomatillos from his family estate in Michoacán. Tonatiuh is in charge of the chilies, though Iván, not happy with a one-chili sauce, always sneaks in some jalapeños and dried guajillos for good measure. Edgar, who was never invited, nevertheless contributes sea salt farmed near his second home in Manzanillo. Block party, building party, chilaquiles party. Mark Fessenden was born in St. Petersburg, Florida. He lives in Mexico City. Image: "Tortilla Basket" by David Boté Estrada.